Optimism is what drives people to success. From athletes to inventors to innovators to celebrities, it’s sheer willpower combined with endless optimism that helped make them successful. When the rest of the world tells them they’re wasting their time or that they will never achieve their dreams, these people work even harder to reach their goals. There is no better way to live than through being optimistic about life. It’s what keeps you motivated. It’s what ensures that things will improve even when they’re not so good at the moment. When you’re optimistic, you see only the good. You’re happier, feel more at peace, and appreciate the world around you so much more. Many people have trouble being positive and optimistic and that tends to be a real roadblock to getting where they want to go in life. If that sounds like you then this is the guide for you. You will learn how to attract positivity in your life, how to be a better you, how to lessen the stress and anxiety through optimism, how to achieve your goals, how to fulfill your potential and much more. You’ll also learn about the significant differences between optimists and pessimists, how to avoid diseases, how to pull yourself up during tough times, how to improve your friendships and relationships, daily habits you can implement to become more optimistic and much more. 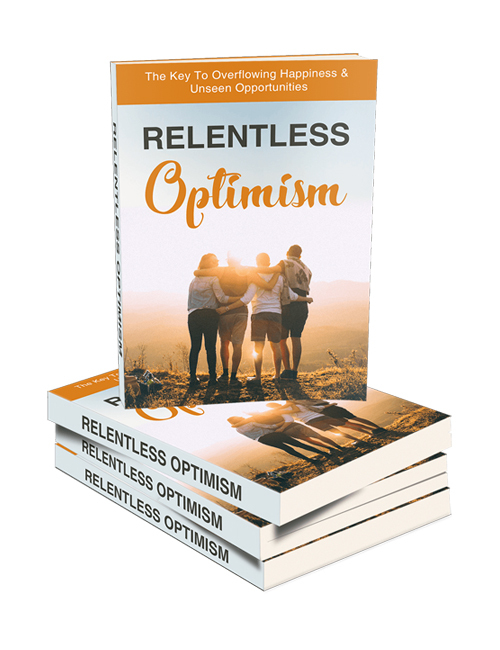 You can also get the Relentless Optimism video course if you want to get the most out of this incredible pack to help you along the way. Get it all now.